Google has so many innovative products for mobile devices . We have already covered Google mobile applications likesearch ,youtube ,orkut and maps . Gmail is currently one of the most used free mail website in the world . Its almost 2 years sine the official Gmail mobile application came into existence . 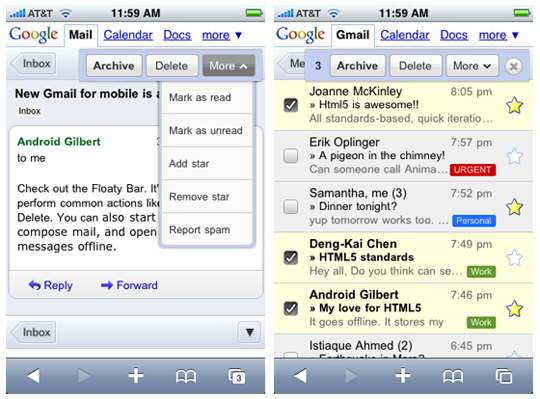 The latest version of Gmail mobile ,2.0.6 has so many features . One of the notable one is the option to ope multiple email accounts . Gmail mobile is a Java software , so without worry we can install it on any phone which supports Java . Download Gmail Java mobile software . Gmail mobile now supports multiple email accounts . Shortcuts to archive ,scroll ,delete email messages and to undo sent messages . View email messages offline :Now you an access/format Gmail messages when there is no internet connection and sent them when coming back online . Gmail mobile now supports more than 35 local languages . 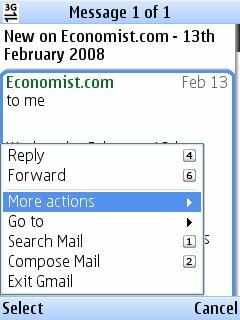 All other old Gmail mobile features like autocomplete , spam protection ,auto refresh ,PDF ,DOC attchement viewing etc, are too available in this version . 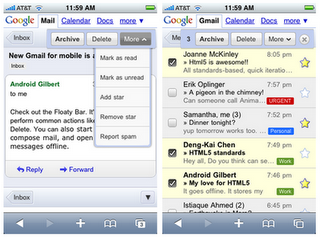 Gmail for mobile is a super performer if you are on an iPhone or Android . We already said Gmail is a Java mobile software . So we can install it on Nokia ,SonyEricsson ,Motorola ,BlackBerry ,iPhone ,Windows mobile and Google G1 phone . Download Gmail mobile software .